Vista Murrieta High School graduate Michael Norman narrowly missed out on a berth in the Olympics today, finishing fifth in the 200-meter final of the U.S. Track and Field Trials in Eugene, Oregon. The 18-year-old's phenomenal bid for Olympic glory ended with a nonetheless impressive time of 20.14, which was just behind fourth-place finisher Noah Lyles (20.09), also a high school sensation from Virginia. The top three places (and Olympic qualifying spots) went to Justin Gatlin (19.75), LaShawn Merritt (19.79) and Ameer Webb (20.00). It's been an amazing season for Norman, who repeated as CIF state champion in the 200 with one of the top times in the nation. In his first heat at the Olympic Trials on Thursday, Norman won going away, posting a wind-aided 20.06 seconds -- his fastest time ever. Tyson Gay, a well-known name in the track world, finished second in 20.36. On Friday, Norman won his semifinal of the 200 meters, covering the distance in 20.21 seconds to beat out Gatlin. 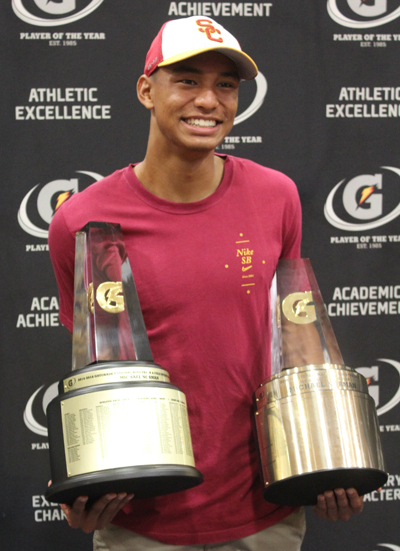 Norman recently was named Gatorade National Boys Track and Field Athlete of the Year for the second consecutive year (photo above). He will attend USC in the fall.